This is one of the most unique family recipes I have. I’ve never seen or tasted it anywhere except for in my Granny’s kitchen. My granny had a small grape arbor, covered with concord grapes and fuzzy yellow bumble bees that were attracted to the honeyed scent. Every September she would pick the grapes to make jams, juice, and pies. 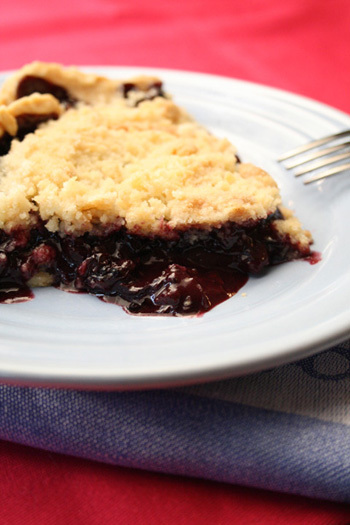 When I serve it, people think it’s blueberry pie but are really surprised by the intoxicating grapey first bite! Wash grapes, and remove the skins, and set them aside. Place grape pulp in a large saucepan; mash a few at the bottom to release their juice. Cook over medium low heat until grapes come to a full boil. Remove pulp from heat, and press through a food mill or strainer to remove the seeds. Stir in the skins, butter, and lemon juice. Add sugar, flour, and salt, into grape mixture, stirring well. Pour filling into pie crust, and dot with butter. Make the crumble topping. Place the flour, sugar, and butter into a food processor. Pulse 10 to 15 times until the flour mixture is coarse and small "pea-size" pieces of butter form. Sprinkle over the grape mixture. Bake at 350°F, 45 to 50 minutes, or until topping is brown and juice begins to bubble around the edges of the crust. Cool 10 minutes before slicing. Cool completely before covering with aluminum foil and storing refrigerated, up to 5 days.